Organizing Time for Things That Matter - Spaces Streamlined Home Staging, Styling and Organizing Gig Harbor, Tacoma and surrounding areas. National Get Organized month and the perfect time to begin accomplishing those New Year's goals for organizing your home, time and life. Remember the saying “A goal without a plan is really just a dream?" This is so true- every plan must include time set aside for working on those goals. Last year I found that I focused so much attention on business activities that it crowded out time for my home, time with my family and taking care of my health. 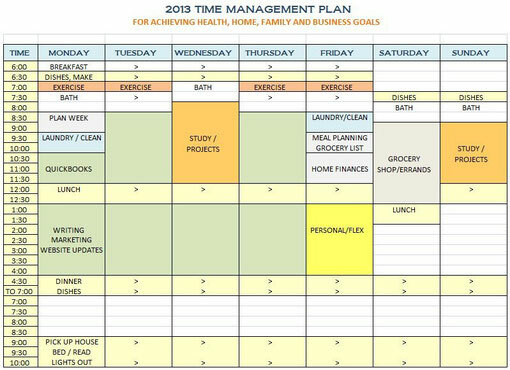 This year my goals revolve around making more time for the things that matter most to me so I created a weekly plan to help me better organize my time (click on photo for clear, full size view). Blocks of activities are represented by color, for example the green blocks are hours I've set aside to focus on business tasks. I've specified Monday as an office day and left the other green blocks open for business activities as they arise since every week is different. I've made sure to plan time into my week for studying and projects I want to work on as well as exercise and personal time. Planning ahead is crucial for me to fit these in! Notice there are plenty of blank squares with unplanned time- this is important for taking care of things as they happen and for relaxing and spending time with my family. I realize this must remain flexible- life will definitely happen and require juggling things around at times! However, knowing I have an overall plan should help me bring my “dreams” closer to reality. I hope this example will give you some ideas for optimizing your time and make room for things that matter in your own life. Wishing you the best for the New Year!